North Smoke Hookahs are well known in the worldwide market for its unique and innovative modern hookah Pipes, Glass Hookahs, Hookah Charcoals, Hookah Accessories, and much more. Now you can enjoy smoking some of your favorite Hookah flavors from while on the go with the new Scorpion E-Vapor Hookah Hose by North Smoke Hookahs. The Scorpion E-Vapor Hookah Hose looks like a traditional hookah Hose and uses vaping technology to produce a flavored smoke-like vapor similar to a real Hookah but without the fire, ash, odor, or chemical substances. The Scorpion Electronic Vapor Hookah Hose is refillable, reusable, and rechargeable and can be used with any E-Liquid Hookah products on the market. One of the best features of the Scorpion Electronic Vapor Hose is the ability to mix and match flavors just like smoking a real Hookah as the Scorpion E-Vapor Hose can use any combination or mixture of e-liquid flavors in the market. 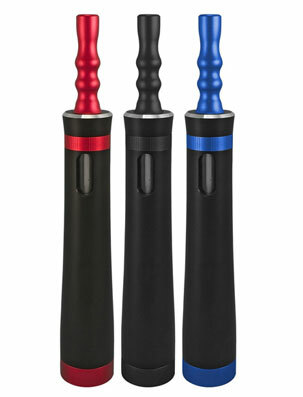 The Scorpion E-Vapor Hookah Hose offers a 100% Tobacco Free smoking experience in any setting.